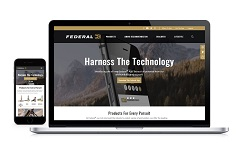 ANOKA, Minnesota – – Federal Ammunition’s new website makes it faster and easier to choose the right loads, learn about industry-leading products and the technology behind them and find the best deals on ammo. Our redesigned site with enriched content, action photos and engaging videos will allow you to fully immerse yourself in the world of hunting and shooting sports. • Dynamic Federal Ballistics Calculator helps users quickly determine the trajectory for any rifle or handgun load and save data for an unlimited number of loads, including previously saved loads from the former site. • Extended “Reloading” section which includes component products and rifle and handgun reloading data that lets users choose their cartridge and filter by attributes such as bullet weight and powder type to find the exact recipe for producing the desired performance. • Lifestyle videos including stories on brand ambassadors, hunting, shooting sports, advocacy, conservation, education and mentoring. • Upgraded user engagement including access to Frequently Asked Questions section, ability to read reviews, rate Federal products and share opinions, experiences, images and videos. • Highlights from Federal’s social media channels, plus opportunities to join the conversation and be featured on the Federal website.